All bookies are equal, but some bookies are more equal than others. George Orwell would have told this about William Hill, if he had written “Bookmaker farm”. William Hill is a top bookmaker and has earned its place among the world's foremost companies on the bookmaker market. The company is listed on the London Stock Exchange. It’s a real legend in the betting industry and one of the most popular bookmakers all over the globe. William Hill, an industry pioneer, has been doing its business since 1934! If you’re looking for the most reputable bookmaker with a well-established reputation you should pay close attention to this company. 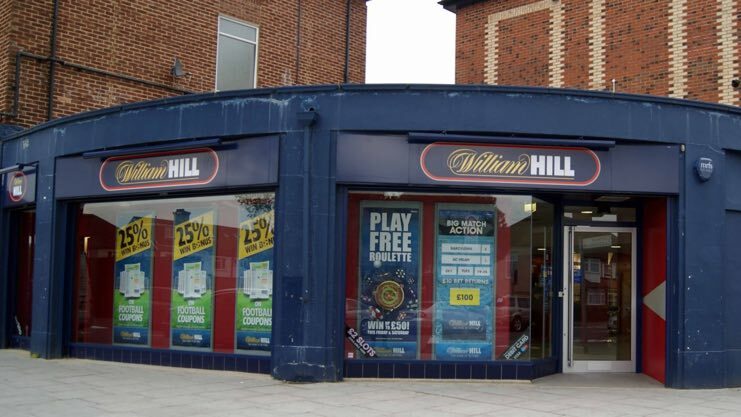 William Hill employs about 16 000+ people and it’s the largest UK operator representing about 25% of the UK’s market with over 2 300 licensed betting offices. William Hill is a well known name in gambling and one of the most reliable partners today. Being one of the oldest on the market the company operates through retail outlets, telephone betting services and online. William Hill moved its business to Gibraltar for tax reason in 2009, but the bookmaker obtained a license from the UK Gambling Commission in order to legally operate in the UK. William Hill is a member of the IBAS. US players are not accepted. William Hill has become the major bookmaker for football betting providing a great range of leagues and fantastic in-play betting platform. Football betting business ensures roughly 60% of all revenues. The company was also the first who offered American sports betting markets. William Hill takes pride in having its own army of analysts, that’s why its odds are always unique. The company has own school for personnel in order to offer the best service and customer support. And of course besides sportsbook the bookmaker also provides casino, poker and other gambling services that attracted over 3 million customers! The company always gives a generous free bet or bonus to newcomers. 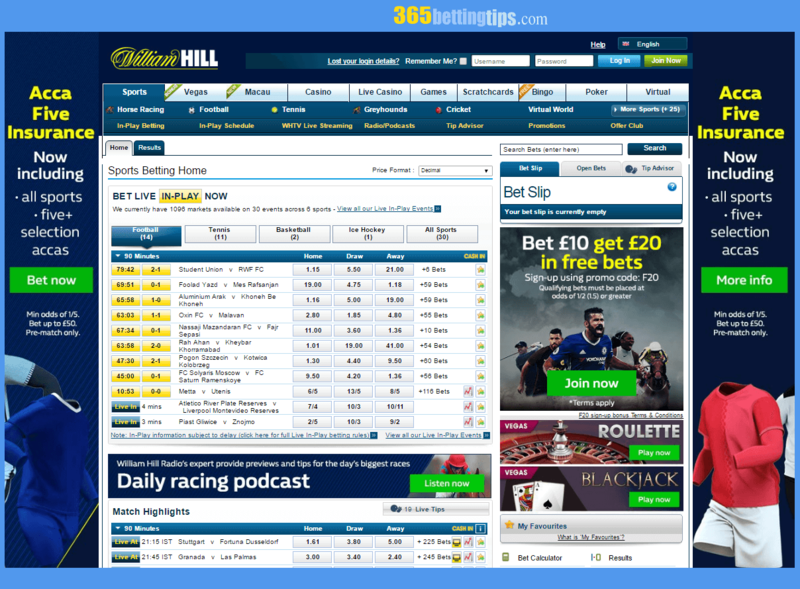 A long-standing reputable company and a true icon of the betting industry William Hill is a bookmaker you should draw your attention, no matter who you are, a beginner or a professional punter! If you’re visiting William Hill website for the first time it can distract you with too many promotional banners and you can think that this site is not fast enough. Using this betting platform for a few minutes you’ll see that is not true! As a matter of fact William Hill has one of the fastest sites in the industry. When you select the section, for example football, all ads will disappear and you will find that this website is extremely quick! Recently, a few changes were made and now the betting platform is close to perfect. A simple horizontal three-lines menu ensures a quick access to all functions. You can choose the gambling section in the first line: sports, casino, live-casino, games, poker, bingo, Vegas and virtual. The most popular games such as football, horse racing, tennis, etc are on the second line. In-play betting, in-play schedule, WHTV live streaming, radio/podcasts, tip advisor, promotions and offer club can be found on the third line. For your convenience there are some useful tabs like home of football, daily match lists, coupons, all competitions, team A-Z, specials and virtual football. As this bookmaker covers all range of betting events sometimes it is hard to find the necessary event, so you can use “search” function by entering a team name. You may of course choose odds format (decimal, fractional, American). The site is available in more than 20 languages. It has a simple and functional navigation. Special thanks to William Hill for a wonderful bet slip which displays all the necessary information. Just choose one or more selections and you’ll find them in the bet slip, now you can make a few singles or Accumulators / Multiples, check estimated returns from both types of bets, total stake for all singles, and delete any selection or clear slip. You can also find your open bets and Tip Advisor logo in the bet slip, click and you'll see comments of others punters who placed their bets. As for an accumulator bet it is very easy to place it in “Today's Matches” section. Besides, there is a statistical section with useful betting information on the website. You can always use the feature called “Cash in my bet” that lets you take the money prior to the end of the event. And it doesn’t matter whether you made a single, multiple or in-play wager. There are also video previews, news highlights etc. You can find all key sections on the main page of Sports Betting Home: all live In-Play events, match highlights, hot offers, coupons and list of all competitions. You can watch sports events streaming live on the site! WHTV is available for those who have a positive balance on the account, so first of all you must open an account. If you want to get access to all offers it is necessary to register. Click the “Join Now” button and establish an account filling out a simple registration form providing the necessary information (username, password, name, date of birth, email address, mobile number and address). 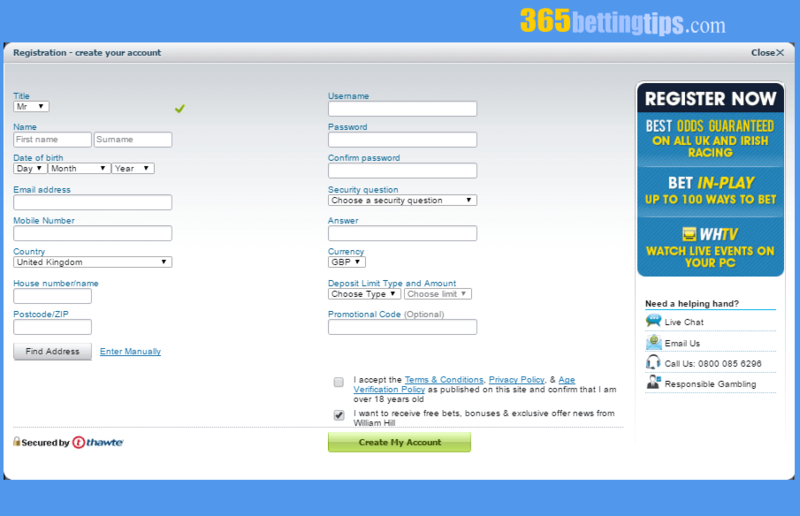 You can transfer money from the sports betting account to casino or poker room. To start betting first of all you need to make a deposit to your William Hill account. Simply click “My Account” and you will see your account page. The bookmaker offers the widest range of payment methods - more than any other competitor. You won’t have any problems with banking but if you do have some difficulties just contact the technical support available on your account page via e-mail, live-chat or phone and your problems will be immediately solved. 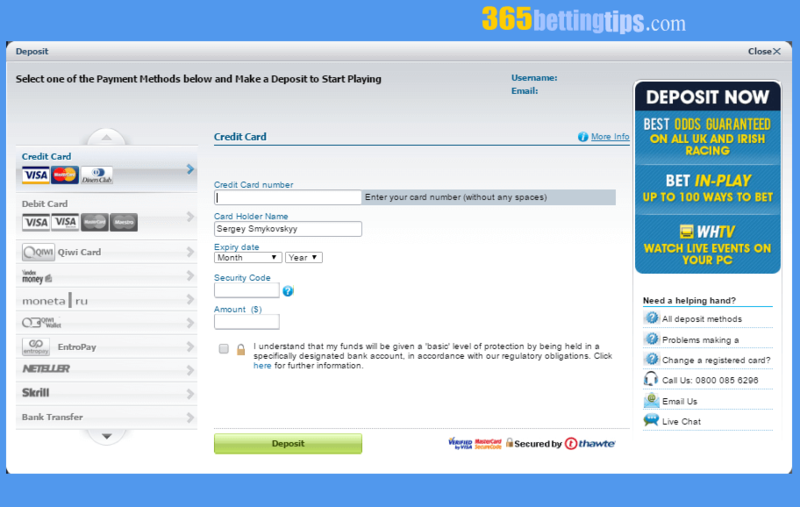 You can change a deposit method, manage your account information and check current promotions on this page. The list of payment options is ridiculously long and there are plenty of ways you can deposit or withdrawal. William Hill offers all popular payment methods, but please be aware that different methods have different limits and transaction time. First check data on terms for your country. Please be prepared, there can be changes in bonuses and deposit/withdrawal options. The most popular methods are debit and credit cards and e-wallets. You can use bank transfers or personal cheque, but these methods have longer transaction time in comparison to others. All deposit payment options require at least €10 deposit with immediate transaction time, except for a bank transfer (3-5 days), cheque (up to 2 days) and Western Union (up to 2 days). Please note that all transactions do not require any fees, except for a bank transfer service (₤15). Neteller, PayPal, Skrill and Click2Pay are the most popular e-wallet providers. Maximum deposit to William Hill is ₤10 000 to ₤100 000. William Hill has developed its payment method “William Hill CashDirect” which available only in GBP. You can purchase vouchers from William Hill's betting shop. Withdrawals are allowed from £1 and it’s a real plus. There won’t be any problems with money withdrawal. You can use the same methods as for depositing with only a few exceptions. Withdrawals are processed quickly so you will receive your money within a day or two. Visa, Mastercard, Maestro, bank transfer and cheque are slow methods; we recommend e-wallets such as Neteller, PayPal and Skrill as they transfer money instantly. Maximum withdrawal from William Hill is ₤10 000 to ₤30 000 for major methods. Some methods have no limits at all. It is worth mentioning that this bookmaker reserves the right to request a photocopy of your personal documents when you request a withdrawal. Don’t worry it’s a standard procedure! You can be sure that you will always find the necessary market here because William Hill offers one of the widest ranges of sports and betting events in the world! Their betting coverage are really extensive, for instance, there are more than 30 competitions only for UK football and it’s not a joke you can find great odds even on Uganda Premier League matches. Betting coverage is a huge advantage of this bookie. All major leagues or tournaments as well as obscure competitions can be found here. William Hill also offers fantasy sports and virtual sports betting with unique markets. You get a top class product for all your needs! Just imaging William Hill covers over 60 000 football matches per year. The bookmaker provides a variety of sports as horse racing, football, tennis, greyhounds, cricket, virtual world, American football, boxing, ice hockey, baseball, cycling, winter sports, basketball, snooker, volleyball, darts, golf, pool, UFC / MMA, rugby league, rugby union, bowls, motor racing, motorbikes, handball, politics, lotteries, TV/Specials, E-Sports, etc. This bookie mainly focuses on football and horse racing, but also strong on other markets, especially North American sports. It has a strong coverage of North American sports with competitive odds. When it comes to football none bookie in the world can't beat a British legend! They have over 250 different bets per match with a small margin and handicaps at the biggest odds on the market. Besides William Hill offers Match Result and Both Teams To Score, Match To Be 2-0 At Any Point, Both Score No Draw, Correct Score, Double Result, Goalscorer Markets, Match Handicaps, Draw No Bet, Match x Goals, Player Scores Both Halves, Win Both Halves, Win Either Half, Come From Behind And Win or Draw, Penalty Awarded, Corners/Cards/Stats bets, Half or 5 Minutes Markets. You can also get everyday bets with enhanced odds. But there are no Asian handicaps which is one of the biggest upsets for punters. The variety of NBA, NHL, MLB games is also great. Just like the other major bookmakers William Hill provides the “Cash In My Bet” feature which gives you a chance to sell your bet at an appropriate price (single or multiple). William Hill proposes extremely high odds, especially when it comes to North American sports and European football. An average margin is 4.5% which makes a good value to all punters. There are the following sports betting margins: football - 5.4%; ice hockey - 4.5%; tennis - 5.4%, basketball - 4.0%; baseball - 3.9%; American football - 3.9%. William Hill has built a strong reputation for gambling. Company has a really good online casino section; you can play in the browser or download the software. When you make your first deposit you will get a welcome bonus. There are plenty of poker tournaments and classic types of game and slots with big jackpots. William Hill provides one of the best Live In-play betting in the industry. Bet365 is maybe the only opponent who can be compared with William Hill. The coverage is truly comprehensive! Hundreds and maybe thousands of events for weekends are featured in this section. As it was mentioned before the main focus is on football matches, but there are a lot of sports offers every day. There are about 60 In-play markets available on a single football match, but when it comes to big tournaments like Champions League or English Premier League, you will for sure find 200+ betting markets for top competitions. As a matter of fact you will have the same number of in-play betting markets which were available pre-match. 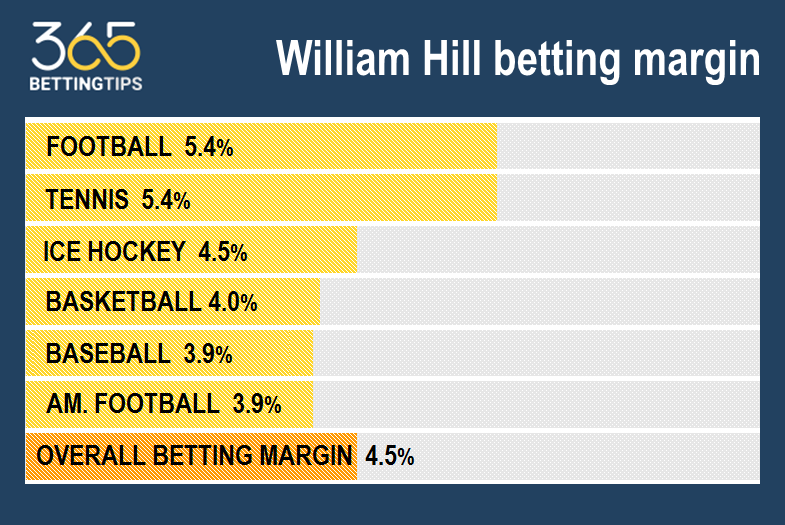 Odds are above average; William Hill operates on a much lower margin than its competitors pre-match margins. Live in-play betting service is available 24/7. You can always check the scheduled events in order not to miss your chance to place a required bet. It is really quick if using In-play betting console even for accumulator bets. William Hill Live In-Play betting platform is easy to use: all events are arranged by kinds of sports and you have a clear overview of all available live events. Just click the match and find hundreds of markets with dropping or rising odds, broadcasting or infographic with pitch picture and some other useful information, statistics and commentary. You can add an event to the “My Favourites” tab. You can use “Cash In My Bet” if the bet is still running; it allows the opportunity to fully or partially settle a bet at the cash. If you are not just a punter but also a sport fan and like to watch matches, William Hill provides live streaming service on its website. It’s completely free but you must have a positive account balance or place a bet in the last 24 hours. The minimum system requirements are very low (internet connection speed of 500 kbps or higher). Please note there's a 20 second time delay. So with WHTV you’ll never miss any of the action! William Hill live in-play radio broadcasts during the game is like the cherry on top - you can even hear an expert opinion which helps you with a bet! William Hill is one of the largest bookmakers on the market so you can place a huge bet here. The British company remains loyal to winning punters and it’s also a good bookie for beginners as the minimum bet is just ₤0.03 for singles and multiple bets and only ₤0.01 for accumulator 4's and upwards. Such limits give you a lot of possibilities. The maximum bet usually depends on the popularity of the sport, the type of competition or market and is determined on a bet-by-bet basis. In accordance with the official rules Will Hill has the right not to specify the maximum amount of stake, but it has maximum (excluding stake) winning limits per day (the equivalent in the currency of your account). As for multiple or accumulative bets which were selected from different sports the lowest maximum winning limit will apply. Football lines have maximum winnings of £2 000 000 for top divisions and international games (full time result); £500 000 (main bets as Over/Under, Handicaps, Correct Score, BTTS, etc. ); £100 000 (other types of bets). Maximum winnings for lower/obscure leagues are £1 000 000 (full time result) and £100 000 (all other match markets). It’s only £5 000 to £100 000 for friendlies. The maximum winnings for tennis, basketball, ice hockey and other sports are up to £250 000. Maximum winnings for horse racing are different. Maximum winnings are limited to £1 000 000 (race winner singles) in UK and Ireland, up to £500 000 in France or Dubai and £10 000 up to £100 000 for other meetings. You can always expect the same great service when betting on your mobile! If you do not have access to your computer just download apps, which are available for iOS and Android. The procedure is very easy and fast. Please note that you can use your current William Hill account to sign up for apps. All other functions are available, you can join, make a deposit or withdrawal, place any stake on any market just like on the website. If you are planning to receive regular winnings and want to be a professional punter you must be sure that you can place bet anytime and anywhere to never miss potential earnings. 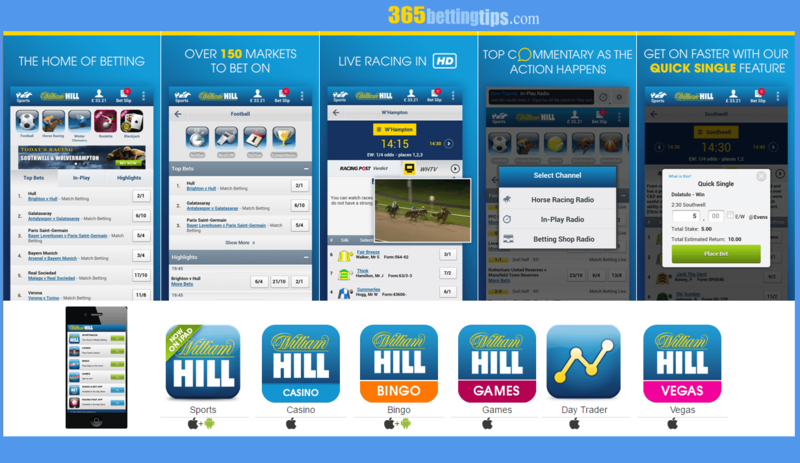 You can use William Hill mobile version on your tablet or smartphone. It has all sections and is easy to navigate. The app shows all special offers and free bets. For example, you receive your stake back as a free bet if your horse will come in second; if a football match finishes 0:0 and you were betting on the correct score William Hill will refund a double stake as a free bet; if you place 6 or more team football accumulator and only 1 team loses, the bookmaker will return your stake as a free bet! William Hill also guarantees best odds on UK and Irish horse racing in the world. You can always enjoy all betting features with William Hill sports betting App. The bookmaker offers six mobile apps: sports, casino, bingo, games, day trader and Vegas. Unfortunately only sports betting and bingo apps are available for iOS and Android; casino, games, day trader and Vegas apps are only for iOS. The company was founded in 1934 and since then has been one of the leaders in the betting industry. Trust and loyalty of million of customers for nearly 100 years prove the reliability and fairness of this bookmaker. William Hill operates worldwide and moved to Gibraltar to avoid paying betting taxes in 2009. Every bookmaker is known for certain things: highest odds on the market or generous bonuses, but when it comes to William Hill there is no doubt these are safety and fairness! A British brand is the most-trusted in the world, you will surely feel safe betting with this bookie, just stop worrying – all personal data are protected by Thawte’s SSL encryption technology. William Hill has definitely one of the most reliable websites for betting and it’s an excellent online gambling destination. Finally, this bookmaker has a truly friendly attitude towards winning customers which is indeed a substantial argument as betting is a fun process only when you don’t play for high stakes, but sooner or later you will need a trustworthy and reputable bookie! William Hill is probably the most responsible partner in the betting industry. William Hill takes care of its customers like no one else providing excellent support services. Customer support service is always available; qualified specialists trained in own school for personnel won’t disappoint you. When you face a problem first visit the FAQ section and try to find answers. It’s easy and fast because all questions are sorted by category. In case you don't find the answer for your question, you can enter a keyword in the search box. All bookmakers have Twitter accounts, but only William Hill answers customer requests, which is another great way to get in touch with your partner (@WillHillHelp). But usually live chat is the fastest and easiest way to get answers. To access Live chat you must be logged into your account. It’s really an efficient way to save time of course if you speak English, Spanish, Deutsch or French. A traditional British bookmaker has been one of the biggest names in the betting industry for years. No doubt it’s a major bookmaker for football betting providing high-quality live in-play services. Wide range of betting options, fast and good looking website, great odds and many promotions – all you need to enjoy betting. Besides, there are unique Tip Advisor and News/Blogs sections. But unfortunately, there are no perfect bookmakers; all have their own weaknesses and strengths. There is nothing easier than to recommend William Hill for all punters, beginners or professionals. William Hill is one of the most famous, trustworthy and reputable brands in the betting industry. This is one of the best all-in-one gambling sites! You can enjoy not only sports betting here but also casino, poker room and internet games. Besides, there are financial and entertainment markets. At present William Hill holds about 25% of the Great Britain’s betting market. Don’t forget about a fantastic radio and video coverage of sports events and useful infographic. These are all necessary tools for a winning betting strategy. William Hill has always been an industry pioneer providing extensive markets with high odds for so many years. The bookmaker offers the best services you can get - friendly customer support, excellent apps and mobile products as well as best live in-play section for football and Best Odds Guaranteed on horse racing. Maybe some of bonuses could be improved, but usually they offer a great variety of promotions.